The BIMA (British Interactive Media Association) Awards competition is renowned as the UK's leading interactive media awards, setting the standard for the industry and celebrating creative excellence and craftsmanship within digital media. In 2002 Foxtons took first place in the Consumer and Public Services sector for having the best application aimed at providing information to the public. The site impressed the judges with its clear understanding of the needs of the user, and the fact that it was so well laid out, easy to use and provided effective communication. 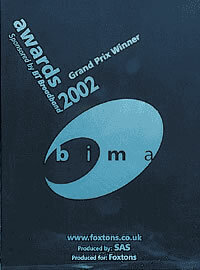 Foxtons.co.uk was then named joint winner of the overall prize, the BIMA Grand Prix Award. This category could not be entered; the award was given at the judge's discretion to the best overall entrant.